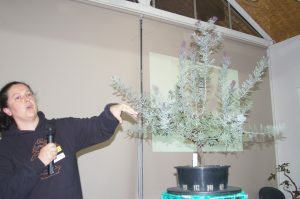 This turned into quite an interesting presentation and discussion meeting, as we looked at, firstly, the range of Australian native species which are considered to be deciduous, and then looked across some of the wider native species world to discuss the considerable diversity in leaf shape and colour and the possible uses and challenges of these in bonsai. 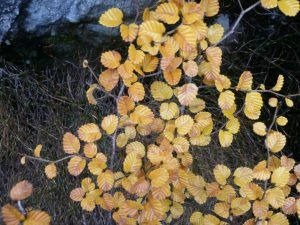 While the range of deciduous species is very narrow in Australian natives, there are some intriguing possibilities in species such as the Deciduous Beech of Tasmania Nothofagus gunnii, (if we can propagate these more readily), with its glorious small leaves and great autumn colours, Melia azedarach (White Cedar) with its compound leaves but great perfumed flowers. Others included in this group were Brachychiton acerifolius (Illawarra Flame Tree), Adansonia gibbosa (Australian Boab Tree), Toona ciliata (Red Cedar), and to some degree, Grevillea robusta (Silky Oak). Several other species with interesting colour in their leaves, especially in new spring growth, were presented for discussion, including Acacia baileyana “purpurea”, Melaleuca linariifolia “Claret Tops”, and Nothofagus cunninghamiana, with its great bronze-colored new foliage shoots. The fascinating range and diversity of leaf shapes was discussed, although given the enormous range of possibilities, only some examples could be covered on the night. When we look across various genera, including Eucalyptus, Brachychiton, Hakea, and especially Grevillea, leaf sizes, colours and shapes demonstrate a quite amazing range of diversity. 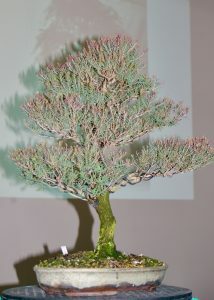 In addition, other groups including the Australian native conifers and the Casuarinas / Allocasuarinas have their own peculiarities and attractions in leaf shapes. 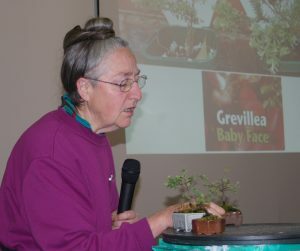 All in all, an interesting discussion of some of the many options, highlighting our opportunities to continue to develop and present Australian native plants as bonsai with leaf features which complement the style and form of good bonsai trees.